This District is largely residential, made up of terraces and tower blocks, with some small-scale industrial units. It is dominated by motorway infrastructure and could have much more active connections and links to the city centre. The area was subject to major clearance and redevelopment in the 1960’s, removing most of the historic street patterns and existing tenements in favour of tower blocks. This means that there are opportunities to fill in gaps and focus on making the District more liveable. The campaign for the Townhead Village Hall shows how strong the community is and this will be a really valuable resource as plans are developed and start to get implemented. 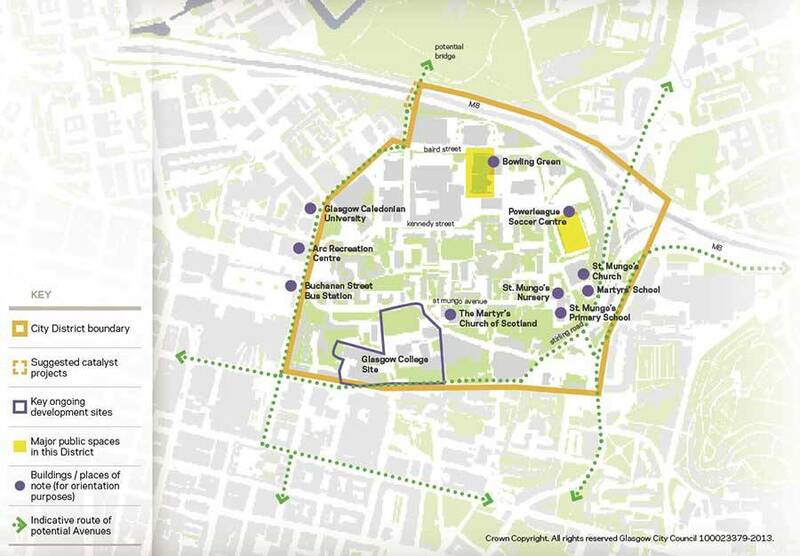 The increase in the student population that The City of Glasgow College Campus redevelopment has delivered is a great opportunity to look at the public realm and amenities. There is a project which could also help Townhead connect to the rest of the city and that is the potential development of the Sighthill landbridge connection.